Analysis: Labour gathers in Killarney this weekend hoping to reverse its increasingly worrying poll numbers. SOME LABOUR TDS gathering in Killarney for its annual conference this weekend would privately acknowledge (although probably not to journalists) that this could be one of their last as Dáil deputies. Various apocalyptic predictions say Labour could return between zero and 10 seats at the next election. Some senior ministers will face ‘Portillo moments’ on count day. No one is safe, including the Tánaiste who finds her Dublin West seat in serious danger from Sinn Féin, the Socialists and a potentially resurgent Fianna Fáil. In London this week, Michael Noonan said that a “devastating election” for the coalition would include the junior coalition party losing 18 seats. Labour strategists privately believe that between 15 and 20 seats is a realistic target at the next election. The problem is that the current opinion polls – volatile though they are – do not indicate that this is any way likely. On current form, Labour will be lucky to get into double digits when its comes to seats in the 32nd Dáil. Prior to last year’s local and European elections some within the party believed that holding between 10 and 12 per cent of the vote would be a decent result in the circumstances. But it won just 7 per cent, demonstrating a clear disconnect between what Labour figures thought the electorate thought of them and what the electorate actually thought of them. Whatever happened to ‘The Burton Bounce’? Off the back of Joan Burton’s election as Eamon Gilmore’s successor, there was much talk in political circles of ‘The Burton Bounce’. We wrote extensively about why Labour appeared resurgent under its new leader who was doing much to address the concerns of anxious backbenchers who’d become disillusioned under Gilmore. Indeed individuals in Labour believe Fine Gael has gobbled up some of its initiatives in recent weeks as the senior coalition party seeks to occupy that crucial middle ground. For example, the Taoiseach dominated the announcements around the Low Pay Commission yesterday, despite this being a fundamentally Labour-driven policy headed by Minister Ged Nash. As a result, Labour stands at 7 per cent in the latest Red C poll, down two from the previous month. This can primarily be attributed to its awkward stance on Clare Daly’s abortion bill where Labour deputies apparently wanted to support the bill but felt, on legal advice, that they couldn’t. To voters who already feel that Labour has rowed back on many of its pre-election promises, this was another example of the party saying one thing and doing another. More than anything else it has contributed to the widespread public perception that Labour said one thing during the election, but did another once it came into office. The truth is not as clear cut as that. But the finer points don’t matter to a lot of voters who will primarily be concerned with their own situation at the election. The big questions, perhaps the only question, for many will be: Am I better off than I was four or five years ago? This is where Labour and the government is banking on winning re-election. The coalition will argue that it is the only choice when it comes to maintaining the nascent economic recovery. The view that Fianna Fáil (‘the crowd that wrecked us before’) and Sinn Féin (‘the crowd that could wreck us again’) cannot be trusted will be hammered home by both parties. As long as it’s talking about the economy, the coalition believes it’s on solid ground. Labour’s challenge is not only to make more people feel the recovery in their lives and in their pockets, but convince them that it’s because of Labour that this is happening. Theoretically, Labour has a good story to tell about what it’s done for the country. But whether it can convince the voters is another question. So far it hasn’t done that and just over a year out from the election that should be worrying Joan Burton and co.
Email “Why Joan Burton has a year to save Labour from an election bloodbath”. 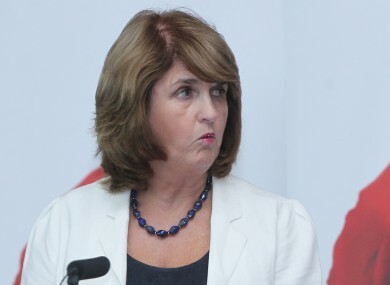 Feedback on “Why Joan Burton has a year to save Labour from an election bloodbath”.